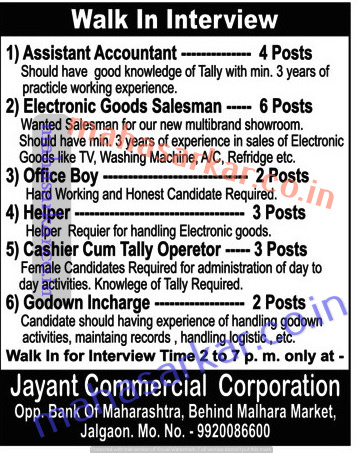 Jalgaon Jayant Commercial (Jayant Commercial Corporation), Jalgaon Published Job Notification for 20 Assistant Accountant – Office Boy & More Posts. Candidates who wish to apply must look at Jalgaon Jayant Commercial Recruitment 2017. Eligible candidates can join Walk-in Interview on November 2017 between 02.00 p.m. to 07.00 p.m.
Interview date & time November 2017 between 02.00 p.m. to 07.00 p.m. Interested & Eligible candidates may attend for walk in interview along with all the documents addressed at Jayant Commercial Corporation, Opp. Bank Of Maharashtra, 140, Bank St, Navi Peth, Ganesh Colony, Jalgaon,Maharashtra 425001. Walk-in Interview at Jayant Commercial Corporation which candidates should be remember as follows. Walk-in Interview on: November 2017 between 02.00 p.m. to 07.00 p.m.